A new hearing aid launched today connects directly to iPhones and other iOS devices, allowing wearers to talk on the phone or listen to music, by GN ReSound, a Danish hearing aid manufacturer. The ReSound LiNX is the first Apple-certified "MFi" or Made for iPhone hearing aid that connects directly to the iPhone or other iOS device without any intermediary devices. Launching alongside the LiNX is a new iOS app that works as a remote for the hearing aid, allowing wearers to adjust volume levels, equalizers, and switch between preset environments for the hearing aid, allowing the device to optimize to the user's environment. Hearing aids can have several different modes, adjusting to the acoustics of each environment -- the app even uses geofencing to automatically change sound profiles based on the location of the wearer, changing for work, home, or a favorite restaurant. There is also a "Find My Hearing Aid" function to help users find their device if it's lost. A company representative told MacRumors that the app was an attempt to connect the hearing aid to the Internet for the first time. By using GPS geofencing, the hearing aid can change and adapt to its environment for the first time without user intervention. The 2.4GHz protocol used by the LiNX is also unique -- the company worked closely with Apple to develop a special protocol specifically for communication between iPhones and hearing aids, and that GN built a new hearing aid processor to support it. It is much smarter about turning on and off quickly, saving battery life and delivering five to six days of battery life in normal use, even with the added technology. ReSound LiNX launches in global markets today as a revolutionary hearing aid capable of streaming high-quality stereo sound from an iPhone, iPad and iPod touch without the need for an additional pendant-like device. 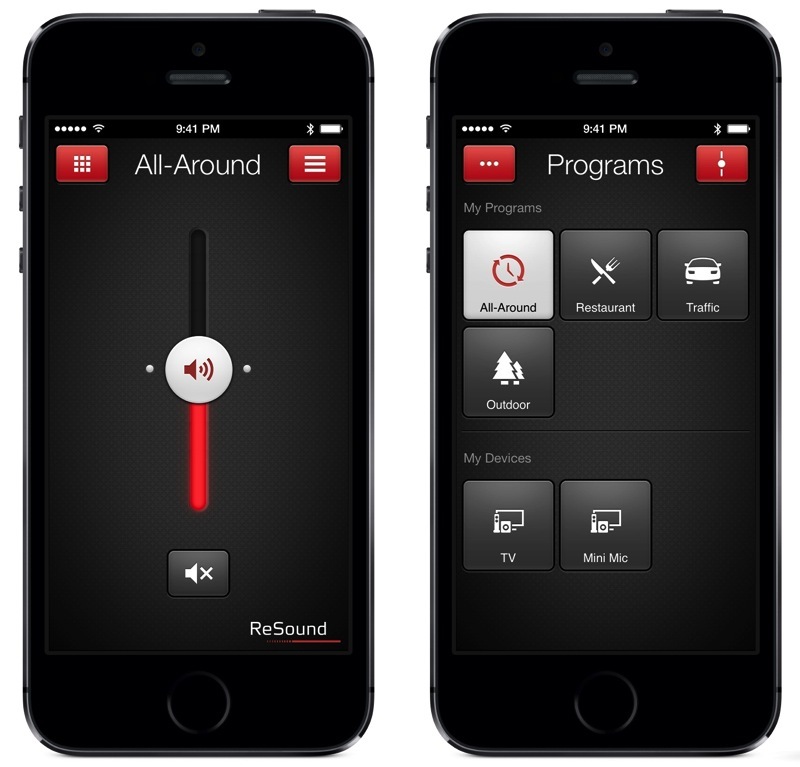 Users can also customize their hearing experience through the ReSound Smart App. 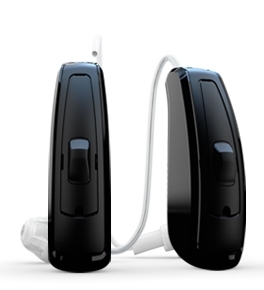 ReSound LiNX advances a number of ReSound technologies which already lead the hearing aid industry. "We saw an opportunity to create the world’s best hearing aid by combining the capability of GN ReSound’s life-changing technologies with the compatibility and global prevalence of iPhone, iPad and iPod touch," said GN ReSound CEO Lars Viksmoen. "We are committed to improving people’s lives through use of innovative technology and look forward to more people correcting their hearing with this new technology – a triumph in accessibility for the hearing impaired." Previously, hearing aid wearers would need to carry a cumbersome pendant or other wireless device in order to make changes to settings on a tiny hearing aid -- adjusting volume or switching between profiles -- now, users can make those changes directly on the iPhone, a device that many are carrying anyway in a significant quality of life improvement. It also allows users to listen directly to games, calls, FaceTime conversations, music, and any other audio directly from the iOS device, without a handheld dongle or other intermediary devices. The technology will be available in hearing aids from both GN ReSound and its sister-brand Beltone, available through the company's network of dealer audiologists. Interested parties can sign up for the company's mailing list on its website. Apple is still astoundingly ahead in accessibility options on mobile devices. That's something that most of us probably don't think about, but it's really great. Instead of whining about irrelevant or easily fixable design details, why not applaud GN ReSound and Apple for bringing an innovation to the iPhone that is not just a gimmick and truly makes life easier for a specific group of users? Eat your heart out, Samsung. It's too bad that app has such an awful UI. Just because users have trouble hearing, doesn't mean they have trouble seeing bad design. It looks like iOS 6 and Verizon had a troubled cyborg child. They want something very, very easy to use. Big buttons! my audiologist told me about these a few months back. honestly, there is nothing groundbreaking in this tech at all, they're just the first ones to capitalise on the "made for iPhone" program. siemens, phonak and starkey are clearly the leaders when it comes to revolutionary design. I wear Phonaks and have a streamer--this is the first set of aids I've seen that have Bluetooth directly built-in and don't require a separate streaming device that you have to wear around your neck. I think that's progress. I think it's great: simple, big buttons that are easy to see, and an easy to figure out "what state is my hearing aid in" UI. It is nice. I wonder how long it will be until they are forced to iOS7ize it? Because they eat up batteries quickly, we're not there where the tiny batteries can be recharged well like our current AA/AAA batteries. It's already super small and high-end hearing aids have a super powerful processor (sometimes more than one) filtering out sounds and amplifying certain sounds depending on the hearing loss of the wearer. I go through two batteries every two weeks. They're not really expensive if you buy the generic box sets from Germany but they're also not covered by insurance. I have a hearing aid and I've never needed the neck dongle for volume. Pretty much all hearing aids have volume control and several settings like tcoil to use when you're on the phone. I'm semi interested in this product but I don't see any note of what level of hearing loss is acceptable to use the product. For instance I have pretty severe loss and only high end aids work for me. I would LOVE it if apple actually released their own hearing aid. Hearing aids are 50-60 year old technology if not older, and while they've grown leaps and bounds, many of us still have troubles with clarity and volume, filtering out background noises and raising high frequencies etc. They're not talking about volume control, they're talking about using your iOS device to store multiple audio settings for your hearing aids and to directly connect your iPhones without a separate connector. Most digital hearing aids nowadays have limited space for this, only allowing you 2-3 settings in addition to t-coil. In addition, many do not have bluetooth connectivity support to connect to your smartphones. You'd need a separate dongle to connect your hearing aids, often audio shoes with cables or with bluetooth. The problem with bluetooth is that they eat up the battery too fast. LiNX isn't the only one that connects to smartphones for audio stuff but they're the first to directly connect to iPhones without anything required for the hearing aids and using a technology that doesn't eat up batteries. I wonder if/when insurance companies will pay for these hearing aids. I've heard that many insurance companies don't cover hearing aids. Medicare usually do cover simple analog hearing aids (some states probably already upgraded to digital a while ago) for children but after that, almost none covers them. High end digital hearing aids cost between 2500-4000$ each, so you could easily spend $6K-8K to cover both ears. They generally last 5 years if you take good care of them. However, in some states, they'll pay for most of it if you need it for work. I know in NYC, they'll pay most if your income is low and you need the aids to be able to work. I'm absolutely indebted to those state agencies and medicare for giving my hearing aids all my life. My family couldn't afford them before. Anytime a product comes out that actually helps with people's disability, I applaud. This is no exception. Sure everyone can talk about how pretty (or not) the UI is for the app, whether it's innovative (or not), etc. I would simply point out, this vendor worked with Apple to take a step. Not the last one, but a step forward in making the life of a group of people a little bit easier. Before all the trivial complaints, can we all pause and appreciate that this is a good step. More steps will follow but any step that pushes us in the right direction and helps people live their lives is something I applaud and do so loudly. I have Phonak Nadia V. I'd go through a brand battery like every other day but when I found PowerOne, it lasted two weeks for me. I'd suggest finding PowerOne batteries for your Cassia and see if it'll work. I have been using PowerOne batteries for 8 years now. I refuse to use the other brands as they don't do any justice comparing to PowerOne batteries. Then you would be a terrible audiologist!! Any hearing professional recommends Hearing Aids based on the patient's hearing loss first, not the features! Umm, there are several dozens of hearing aids that can fit the same hearing loss profile where in the end, it's actually about the patient's needs, not their loss. If the patients ask about being able to hear calls, music and so on from their iPhones, this would be a proper recommendation if GN Resound is a reputable company. I rather have an audiologist that knows about all type of hearing aids and tell me the best one there fits my needs. I actually had an audiologist who gave me a specific hearing aid because it was *good enough* for my hearing loss but I went for a second opinion. The second one asks about what I'd like to do most of the day, and what I need the aids to do. I wanted to be able to hear voices better but at some other times, I wanted to be able to just surround myself with all the noises without any filtering aka analog type of aid. This one was the one who found me a proper digital hearing aids that could do multiple profiles and let me choose what I want any time. I actually loved the ability to switch audio profiles, it really helped me through several situations. As for those folks who mentioned about analog hearing aids and the difficulties of adapting to it, I agree. It doesn't sound as good as analog but I rather have the digital ones because of the filtering technology alone.